You are here: Virgin Islands News Online » News » Hon Skelton not in favour of the ‘big green bins’ on the roadside! Hon Skelton not in favour of the ‘big green bins’ on the roadside! ROAD TOWN, Tortola, VI- A few Legislators of the ruling National Democratic Party (NDP) Administration, including the Minister who has the portfolio for Health and Social Development Hon Ronnie W. Skelton Minister, are not in favour of the big green bins on the roadside to collect garbage. This was revealed while the Manager of the Waste Management Department Greg R. Massicote was testifying before the House of Assembly’s Standing Finance Committee (SFC) on the 2016 Budget. The member for the Second District, Hon Melvin M. Turnbull asked Mr Massicote about initiatives for litter bins for the budgetary year and the measures to be taken to decrease litter and measures for enforcement of the existing law. To this the Manager of the Waste Management Department (WMD) responded that last year they had an initiative to increase the amount of bins throughout the territory, but it was not possible due to budgetary constraints and assured the member that once the funds are approved they would be imported. To this Mr Massicote advised that he was referring to the smaller litter bins that are about 20 x 20 inches and roughly 3 feet high. 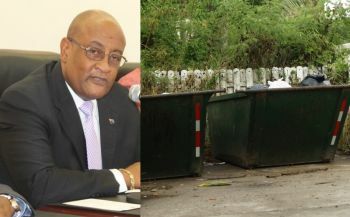 The Junior Minister for Trade and Investment Promotion Hon Marlon A. Penn (R8) stated that other countries no longer use the large bins and have different garbage collection systems and asked if there was an alternate approach other than the large unsightly bins. Mr Massicote warned, cost of collection would go up and contractors would need more equipment. The Manger told the lawmakers, if there are not proper laws to penalise persons for not putting out waste on time they would have neighborhoods and streets full of garbage because of people not putting out trash on time. Finally we are going to look into our garbage. I have noticed a trend in discouraging commercial businesses from using the public garbage bins illegally. This is a move in the right direction. Now remove the large rat infested bins from our neighbourhoods and replace them with two neat smaller ones with covers. While we are at it maybe we could use blue bins for plastic and green for other garbage. I wonder what type he is trying to bring in from China now? I know what you mean cause those green bins have been around for quite a few years now............so why ONLY NOW he noticing them? did he get new prescription glasses??? How soon will the incinerator be working again? To all interested; have you ever taken time out to see the garbage truck just pick up the bin and some one drives along and throws a bag from their moving vehicle and it lands on the ground next to the empty bin ? Have you seen or are you guilty of coming to a full bin and you throw your bag on the ground ,.KNOWING there is another bin just down the road ? Have you seen or is GUILTY of emptying a pickup load into /next to green dumpsters ? Are you gardener who charge your customer to do their landscaping ,them dumps ALL your garden waste into green bins ? 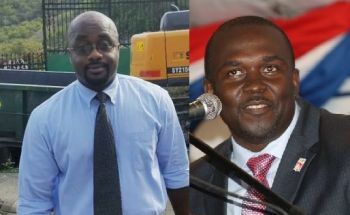 Please lets ALL check our selves and try to keep our BVI clean. NO MORE BAGS ON CAR ROOFS pleaseeee. no china brand to take over the world. Go lay by the side of the road with you all mouth open for the garbage. ...for two reasons. One, Massicote knows that his words were falling on deaf ears, because all the ministries ever do is cut departments' budgets. Two...because I know all of you will hate it...have a central collection point for all garbage. Have persons transport their own waste to a central point, or several, where WMD can do collection from and then boom, problem solved. p.s. I'll check back tomorrow to see how much dislikes I get. I don't dislike your post, but look at it this way. We can't get the community to drive or walk to the corner to throw their trash to the closest public bin, is to get them drive to God knows where? Imagine all of the trash that will be falling off of vehicle tops all over the islands. I get that, but I think it's all a matter of discipline, coupled with a very twisted logic tbh. Why is it, that you're fine having garbage in your house, in your kitchen, where you store and prepare food, but absolutely refuse to put it in the trunk of your vehicle? Does the vehicle hold more value? Someone help me understand that please. As for it being a discipline issue, persons don't get punished for their wrong actions, so they do as they please, when they please, however they please. Government refuses to put money into waste management, that they cannot, up to this day, launch their litter warden program properly. But I digress. SPECULATING AND BEING ON THE JOB IS TWO DIFFERENT THING. OUR PEOPLE IN THE BVI ARE VERY NASTY WITH NO PRIDE YET WE ENJOY WHAT WE SEE WHEN WE TRAVEL ABROAD. HON. SKELTON AND OTHER HONOURABLES WITH THE SAME MIND SET YOUR SUGGESTION IS WELCOME BUT PROPER PLANNING AND THINGS IN PLACE BEFORE MOVING FORWARD. I think he is trying to get rid of the garbage contractors. what about the people who don't have transportation and living in apartments? They will throw the garbage on someone else land when no one is looking. first everyone has to get educated about clearing trash, recycling, being careful about water containers and wanting to have neat yards. The bins are necessary and are put in convenient places for lazy people. And even they don't put things inside. They also dump beds, appliances, construction material that should go to pockwood pond. So who is paying for that to be done? Taxpayers. Green bins or not, it is better than the alternative which is lazy homeowners. You already have garbage all over the place...look closely. Bush News says Disney Cruises want those bins gone. Hi hello, don't worry about "Bush News", what do you want? The people of Virgin Gorda are seriously exposed to health hazards as a result of the Garbage collection and Disposal system. The garbage is collected and taken up into the hill midway between Spanish Town and North Sound where it is piled up and burned. Piled up, burned, piled up and burned. Everything is taken there; regular garbage as well as construction materials, Fiberglass and other poisonous materials from the two (2) boat yards on the island; sewage from septic tanks tanks is also taken to the dump as well to be disposed of. This is a very serious health hazard and no one is talking about it. There has been talks about barging it over to Tortola and taken to the dump site at Pockwood Pond, but nothing ever happened. Considering that Virgin Gorda is such a tiny a tiny island at a mere eight (8) sq miles, and less than ten (10) minutes drive away from either community (Spanish Town or North Sound), collecting all that mess from everywhere, (the community, hotels and villas, yachts and out islands), and disposing and burning it presents a serious problem for our Tourism Island. it is a huge mess and health hazard that should be remedied hastily. .
All I really see is they don't really care about us the people living on Virgin Gorda. This is a very serious issue and no one saying or doing nothing about it. When you drive to North Sound and the garbage dump is burning, all you can see and smell is the toxic smoke covering the whole area. Sometimes you can't even see the road your driving on because of the smoke interfering with the visibility. Depending on the direction of the wind, the smoke travels across to Beef Island and Tortola. I couldn't agree more @reality's comment! This is not good for the people who live or visit this beautiful island and the B.V.I. @reality : I am with you on this , something NEEDS to be done.you mentioned barging to Tortola, Have you seen/ heard about the working condition of the incenerator for the past 6 months ? Where will we store garbage daily before going to Tortola? Will EVERY one who take stuff to the dump park at the VG dock and wait for next available barge ? This is our main port and it is CONGESTED asit is .we need to get with the RECYCLING green programme ,AND. AND it is time for the people who REAP the GREATEST BENIFITS in our island / community step up and play their part .I am talking about the "INVESTORS " who our GOVERNMENT gives ALL the "tax free " benefits , I think villa owners ,hotels and marina owners should PRESENT the VG with an incenerator and provide training to operate and service and maintain this plant . If NDP had interest in VG they will see to it that their "RICH WHITE FRIENDS" make this a reality and let us find a solution for our waste disposal and save VG for generations to come . Garbage is one of the few "free" services in the BVIs. In most developed places, there is a system of collection for which one pays a monthly fee. What we have here in the BVIs is primitive. Problem is to improve the system will take money but nobody wants to pay. Second problem is that we do have recycling options but recycling is never free. It is done because it is the environmentally correct thing to do. Third problem is that besides changing the way people look at garbage, change will be difficult because of the cronyism associated with the collection services. Public monies are spent on this, but is there an account of how much, and to whom? Fourth issue is that on an island everything is imported and so is packaged. All that packaging has to be disposed of but bulk importers do not contribute to the solution. Every pallet is burned when it could be sent back in empty containers for re-use. If we had a halfway decent water supply, we would not be importing water in millions of plastic bottles. Every vehicle is imported and will eventually need disposal, so why not charge a disposal fee so the monies are there when it's time togged rid of them. What about the tires? Hard to believe they're all burned in open air. And so on and so forth...there are a myriad of things, many basic, but we in the BVIs at the end of the day collectively don't care. Harsh to say, but what else could anyone conclude based on the deplorable waste management practices of the territory. Another one of nature's little secrets. well, they could be painted red instead. in any event they are a source of raw materials for certain eateries on Tortola. & pride in most ppl is lacking.